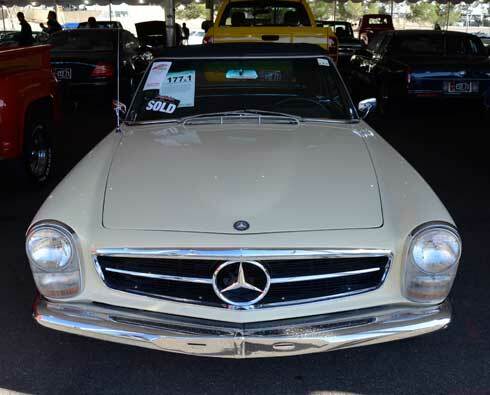 We have compiled just about all the Mercedes auction results for all the Mercedes-Benz vehicles that were offered at the various auctions in and around Scottsdale, Arizona during January’s ‘Auction Week’ 2018. The only cars we left out were a couple of Sprinter conversion vans and a heavily modified G wagen that kind of made us gag while looking it over. 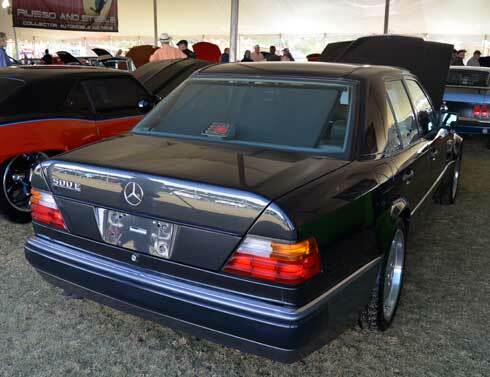 The auction companies included here are Barrett-Jackson, Bonhams, Gooding and Co., RM Sotheby’s, Russo and Steele and World Wide (we did not tally results from Silver Auctions, although there must have been a couple of Mercedes there). Cars are listed together by model or body style, then sorted by year. If the car sold the price will be listed. All prices INCLUDE buyer’s premium. If the car did not sell, the high bid will be listed in RED indicating a ‘no sale’ / ‘passed lot’. A couple of listings were ‘no sales’ on the block, but deals were put together later and the cars were sold, that is also noted where available. In the case of some of the more modern cars, we listed mileage next to the listing, to try to put the sale price into some kind of context. We have written detailed analysis of some of these cars as separate articles here at mercedes-market.com, you can click those links to visit those articles. We will update this page with more such links as we create more in depth analysis articles for the various cars in the coming weeks. G = Gooding and Co.
BEFORE the Arizona auctions this year, we decided to have some fun and go out on a limb, actually publishing our predictions for what various cars being offered would sell for on auction day. 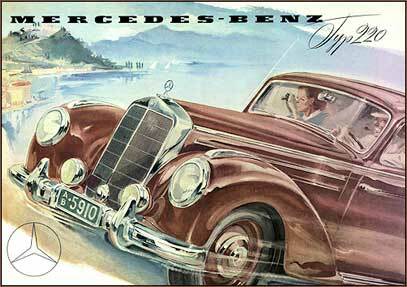 We did this for the Mercedes being offered at Bonham’s, Gooding and Co. and RM Sotheby’s. All predictions were made BEFORE even arriving in Arizona, just based on online auction catalog descriptions (not even the full, long descriptions, you find in the printed auction catalogs). 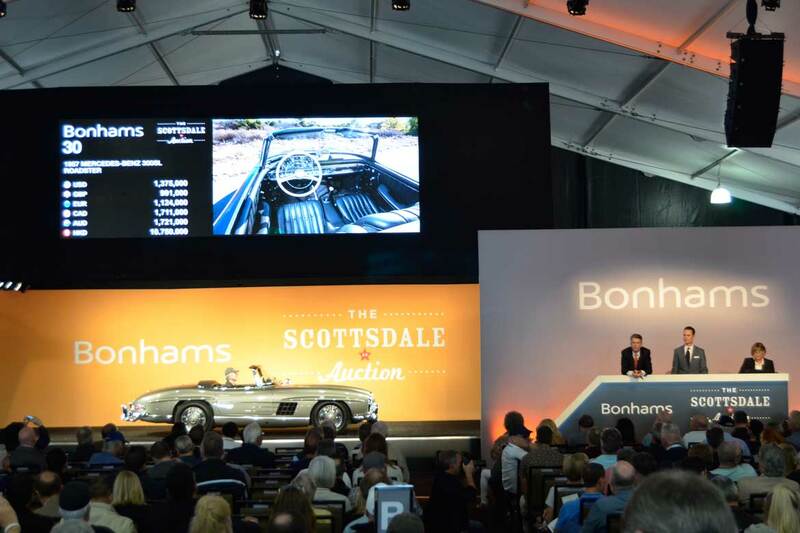 You can see our auction preview articles highlighting the Mercedes being offered at each auction house for Scottsdale 2018 in the ‘Auction Watch’ category of this website. All pre-sale predictions, with some analysis of each car, are published there. Our actual prediction figures are listed next to each car in the lists below along with the dollar difference between the actual sale and our prediction… showing a negative (-) number if we were below the actual sale number or a positive (+) number if we predicted a higher number than the sale result. We surprised ourselves with some of the predictions, at how close some of them really were, especially for some of the cars at the Gooding and Co. sale, the Pagoda SLs in particular. Predicting the $285,000 high bid and ‘no sale’ of the white 280 SE 3.5 cabriolet at Bonhams was also a high point of our ‘crystal ball’ session. While we were close to some, we were tens of thousands away on others, almost $100k off of one of the 190 SLs. In the coming weeks we’ll try to analyze why we were close, or far away and post that analysis. This was all done in good fun, as it’s what we do while sitting in the auction rooms with friends and clients… then we rib each other when we’re way off, or go out of our way to tell the other guys how close we came with ‘that one’. This general overview will give you an idea of what various cars were selling for, but without knowing condition, history, etc. for each car you must take these numbers, and the differences between them, in context. Also too, we can draw conclusions about the market for each model just by looking over the various cars offered and the numbers of each model on offer… look how many modern, R230 SLs wre available this year vs. last! In 2017 there were just three 300 SLs available during AZ auction week, this year, there were seven, a sign that the market has settled enough and sellers have accepted the ‘new normal’ in terms of prices and adjusted the sale price expectations accordingly, it’s not 2014 anymore. Gooding and Company offered 5 of the 7, we’ll dive into why that might be in a future article too. 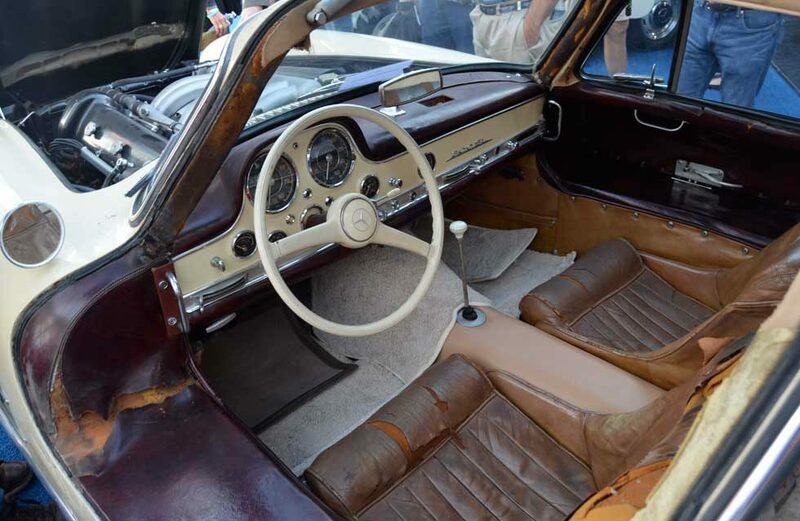 This 1954 300 SL Gullwing ‘garage find’ at Gooding and Company was pretty rough. The pre-sale auction estimate was $1 Million – $1,300,000. We predicted a $1,150,000 sale. Final price on auction day was $1,155,000. 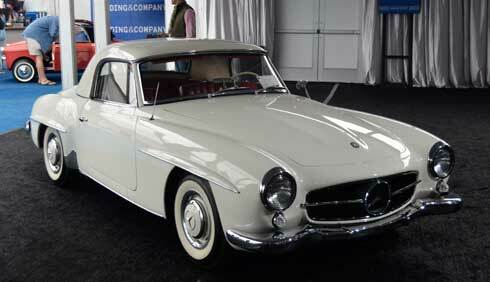 This 1959 190 SL was lot #148 at Gooding and Company. Pre sale estimate was $100k – $120k. In our auction preview article we wrote “this one will struggle to bring $90,000.” Final sale price on auction day was $93,500 and auctioneer extraordinaire Charlie Ross worked hard to get it there! Lot 177.1 at Barrett-Jackson was this Light Ivory 1966 230 SL that, based on its condition, sold for an inexplicable $59,400. This is a fairly typical R107 for Russo and Steele. 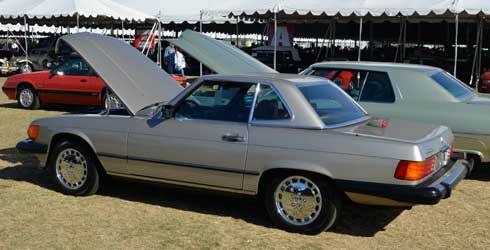 A 1986 560 SL with just over 86,000 miles, smoke silver w/ brown leather, chrome wheels. Sold on Sunday as Lot 816 bringing $19,800. 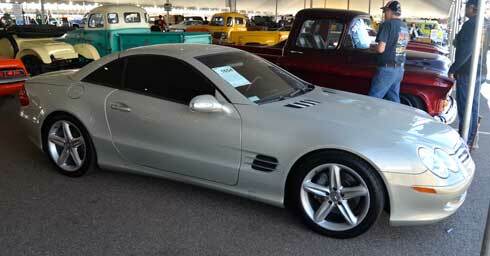 This 2000 SL500 at Russo and Steele was lot 852 and sold for $15,950. It had a two tone black and red designo interior that we’ve never seen in an R129 before. 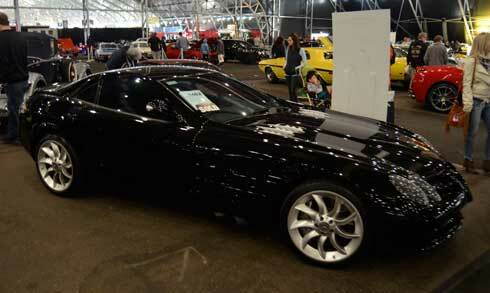 This 2003 SL 500 designo Launch Edition with just over 45,000 miles was lot 1654 at Barrett Jackson this year. Final price was $27,500. 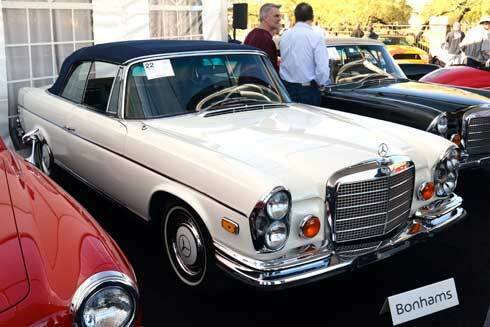 This 1970 280 SE 3.5 Convertible was lot 22 at Bonhams sale in Scottsdale. The pre-sale auction estiamte was $300k – $400k, we predicted a no sale with a high bid of $285,000. On auction day that was the high bid in the room. A post-block sale was made at $260,000 as reported on Bonhams’ website. This 1993 500E was ot 509 at Russo and Steele. It had just under 20,000 original miles on its odometer and sold for a strong $72,600. this 2006 Mercedes McLaren SLR Coupe, lot 1462 at Barrett-Jackson, sold for 236,500 with just over 14,000 miles on its odometer. We try our best to list all the cars offered at all the auctions, it’s not easy, and, occasionally, we miss one or make at typo in the prices, stats. Please let us know if you know of a car we missed or if you see an error in our data above and we’ll correct it. What cars surprised you at the Arizona auctions? Is there one model that seems like an extremely good value to you in today’s market? I love the vulnerability to provide predictions – and then to show the results. Very nice coverage. This site is going to be a fun and useful venue for both MB and vintage guys like me. Thanks for bringing this to bright. Click to learn about this valuable resource and how you can help build it by submitting your photos! 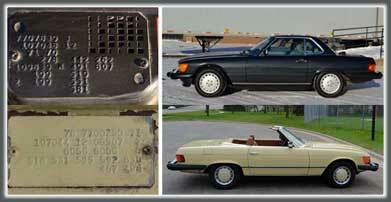 Mercedes-Market: Your Guide to Buying, Selling and Collecting Modern and Classic Mercedes. Based in the Finger Lakes Region of Upstate New York. @2017-18 - Mercedes-Market.com . All Right Reserved.